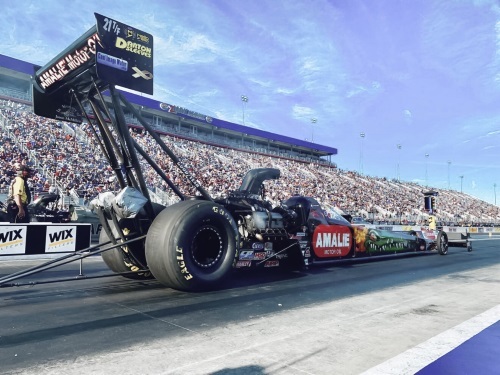 CONCORD, N.C. (October 16, 2018) – Terry McMillen and his AMALIEⓇ Motor Oil XTERMIGATORⓇ team fell short of their desired goal of going rounds at the NHRA Carolina Nationals and moving up in the Countdown to the Championship. The loss dropped McMillen from sixth in points, back to ninth in points with two races remaining. “We know we can move back up the ladder,” McMillen said. “Every round is important in the Countdown. We proved that in Dallas when we went to the finals and proved it again by going out in the first round. All we have to do is get back out there and go some rounds. The next chance for McMillen to improve in the Countdown to the Championship will be NHRA Toyota Nationals in Las Vegas, October 25-28. McMillen will be the defending event Champion.